The Kennerton Vali took me by surprise when it was first announced. I mean I know about Kennerton, see their products but the launch of this and the Odin is serious stuff. I had worked with Fischer Audio going on 5 years though we had not reviewed something from them in a while. They were always known for those sumptuous wooden cups on the likes of the FA-002W though to be fair it was shared technology driving the headphone. 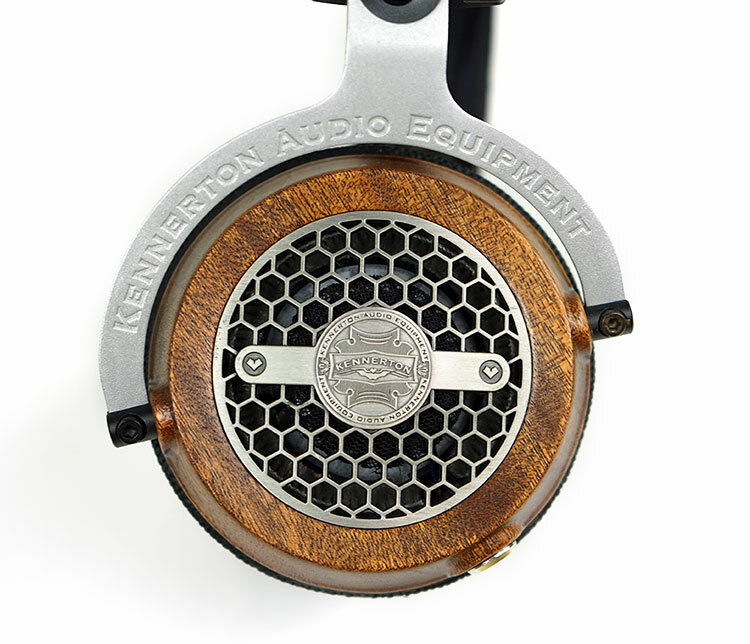 The Kennerton brand was launched by Fischer Audio a few years ago as a full out assault on the ‘luxury audiophile market’. It sort of reminds me of how iRiver refashioned themselves on the DAP market with the Astell & Kern brand back in 2011. 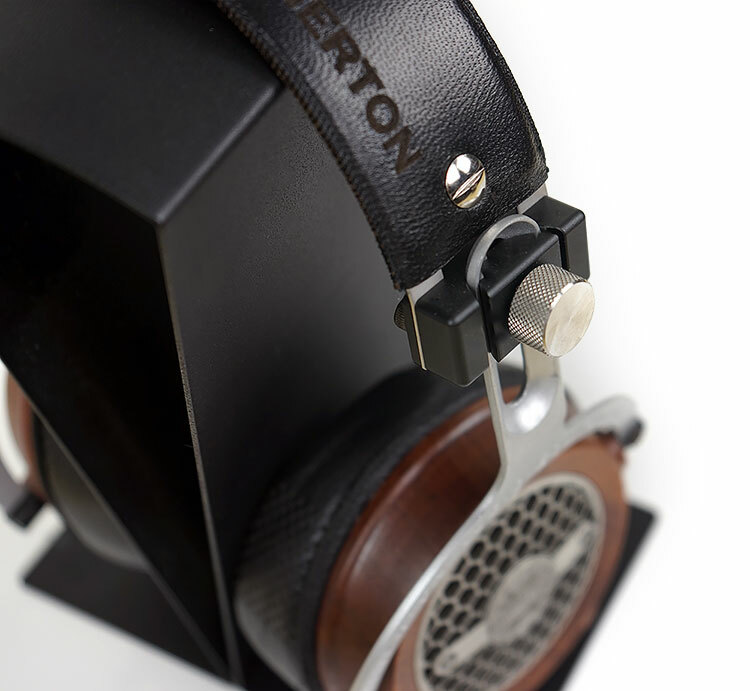 This is a purposeful move to the boutique high-end using better quality materials, drivers and packaging to produce attractive alternatives to those thinking of wading in for LCD-2 and above. The launch of the Odin at $2448 was statement enough, but how about a dynamic driver unit in an aggressive wood finish at $990? The Vali will turn some heads that is for sure. 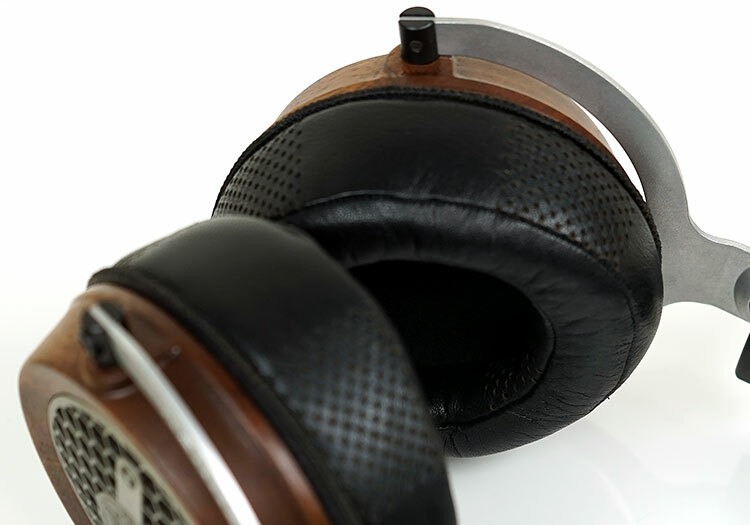 The Vali is priced at $990 and sits second in the product line up behind their $2448 flagship planar headphone, the Odin. 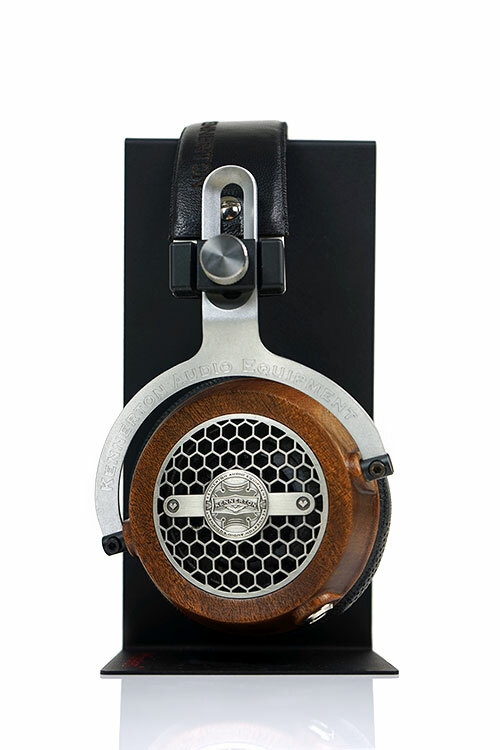 Below it is the FA-011 priced at $369 and the entry level Oldskool 33 1/3 on-ear headphone. 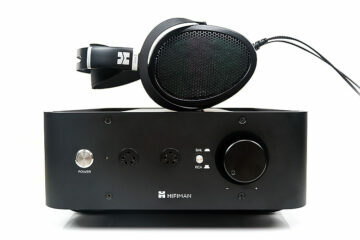 The positioning places it in direct competition with the likes of the Audeze LCD-2, Hifiman Edition X as well as the likes of the Focal Elear which is also a dynamic headphone. The Vali is a 50mm dynamic driver open-back circumaural headphone but that is like 1/10 of the pitch. At $990 you need something different to stand out from those big brands. Whilst the basic engineering principle is not unique the level of attention to the quality of materials and drivers is something Kennerton hope will distinguish the Vali from the pack as well as justify the price point. Differences in pitch start with the driver. The Vali 50mm driver is designed in partnership with Peerless® by Tymphany. This is a composite paper cone driver shielded in a laminated multi-layered film. This approach is drawn from primarily speaker cone designs. Kennerton is pitching this driver material will deliver a superior quality reproduction with a lower mass for better transient response and better internal damping for low resonance interference. They also believe that the Vali cone design will greatly reduce distortion via the stiffened design and multi-layered lamination. That love of wood is strong in Kennerton as it was in Fischer Audio so it comes as no surprise how much of a role the choice of materials for the Vali is in their marketing pitch. Everything from the Peruvian walnut cup finishing, copper litz wiring, to the quality of the aluminum and grill metals as well as the lambskin pads are pitched for both aesthetics and comfort as well as the materials inherent acoustical qualities. The Vali is an aggressively styled but very durable looking ‘chunky monkey’. Nothing about this headphone cries out ‘svelte and low profile’. On a retail shelf, this is one heck of a head turner though with its circular walnut cups and reinforced aluminum and steel gimbals setting the tone from afar. The Vali does have a traditional flow to its form factor though. Think HE-6 or AKG K501 and you are not too far off. Primarily this is an open back circumaural design but for me, it is slightly on the smaller side so it does cover your ear but the spacing is just enough and nothing more. Both cups are terminated with angled mini-XLR type connections much in the same vein as the Audeze LCD series so those with aftermarket mini-XLR cables can slot these in the Vali and use right away. The total weight of the Vali without cables is about 450g which is actually on the heavy side for a full-size DD open headphone. As a point of comparison, the HD800 is 330g, the AKG K812 is 390g and the Hifiman Edition X V2 is 399g. On paper, it is the same weight as the Focal Elear which is also 450g. As mentioned in the Vali pitch Kennerton has really gone to town on the materials used. For the cups, they have used a beautiful Peruvian walnut grain so each unit of the Vali will be unique in terms of pattern. You can get it varnished or in a natural wood finish with a slight discount on the natural wood finish. Personally, I would grab the varnished finish unless you live in perfect room temperature environments and can protect the wood easily. The grills on the Vali are a distinctive honeycombed die-cast zinc alloy with a crafted metal stamped Kennerton Moniker badge sitting centrally. They are fairly widely spaced that you can peek right into the Vali driver assembly so I wouldn’t go poking with a pencil if you know what I mean. They offset the wooden cups nicely giving it all a bit of retro feel which I quite like. The gimbal material is a mix of die-cast aluminum and steel alloy look extremely well built to endure some heavy-duty use. I cannot see these ever snapping off in normal wear and tear conditions. The gimbals on the Vali are arched and have a 3-D swivel design which allows you to roll the cups 180 degrees. The gimbals themselves do not fold flat, rather the screw lock systems control the cup swivel which means you cannot wear the Vali flat around your neck. The gimbal and headband are actually separate components. In total, you have 2 individual gimbals and a single slimmer more flexible metal headband strap encased in leather. 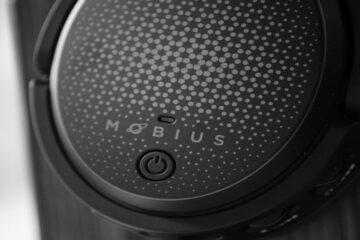 The band and gimbals are locked together with a screw lock system on each side that also doubles up as the headband adjuster. I love how it locks, I love how durable these screw locks look but I am not a fan of the usability of this system. You will not be able to easily adjust the height of each gimbal on the go despite the general recommendation by Kennerton to do so whilst on your head. These are heavy duty locks and sliders so do it slowly and let them adjust naturally then tighten them. Both the pads and the single arch headband use similar lambskin material finishes. The inner pressure balancing strap of the headband though is quite thin and supple to allow for a bit of stretching as it hits your noggin. The rounded pads are much thicker and use a simple foam inner filling so they shape and form around your ear. Apparently, memory foam decreased the level of performance. Perforations for the materials to breath as well as a final tweaking in the tuning can be found top and bottom and are about 1 inch in diameter. They are a bit deeper than Oppo and Hifiman pads but not quite as big and supple as Audeze and MrSpeakers pads. Like the Audeze and MrSpeakers pads, they are wedged at the rear which I prefer on my pads for comfort and seal reasons. The Vali has some peculiarities that make the comfort and fit an entirely personal experience. On my head, the gimbal slider length is too long for the shortest fitting so the cups and pads tend to sit naturally a bit beyond my ears. It also has a fairly aggressive clamp on the sides. On the plus side, the clamping helps mitigate the downward pressure from the weight of the cups and the length of the sliders. However, the pressure balance is not quite right with little or no weight support from the band on the top of my head and almost all of it on the sides. Because of the circular shape, the plush pads will sit not sit totally clear of your ears and some pressure will form on the top and bottom of your ears from the materials also. All of this has an effect of creating an area of dominating pressure to the side and downwards and after an hour or so I started to get an uncomfortable feeling on my ears which required a short rest. I would have preferred a shorter gimbal length to raise the cup by around half an inch and allow the top strap to take on more of the balancing duties. I can mitigate it slightly by pushing the band to the back of my head where the strap makes more contact but it is never that consistent. Again, I must emphasize that my experience may not be your experience and you may find the fit to be entirely comfortable. A quick check on the chit-chat on the usual forums and sites would seem to suggest with some loving the fit and others who need to grow their heads like me. The Vali comes with a single detachable cable in a beautiful tin that resembles an old-time ingredients container. You can also buy their custom braided cable with various terminations which I actually prefer over the stock cable in terms of build quality and performance. Note the cable will cost an additional $390 but it is also wired for mini-XLR so Audeze fans take note. The stock cable uses an OFC wire and the premium cable uses a custom Litz wire. Both are finished differently with the custom litz cable using a braided geometry in a soft cloth weave jacket terminated with a gold plated quarter jack. This is a beautiful cable and very easy to work with. It has zero memory retention and microphonics. 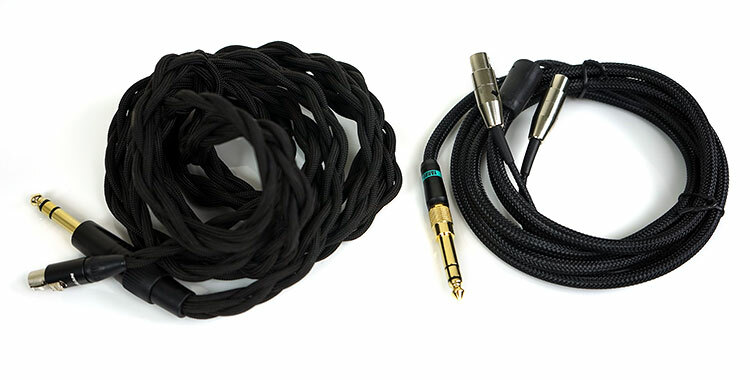 The stock cable uses a slightly stiffer charcoal colored nylon weave and terminated with a 3.5mm gold plated stereo jack. It also comes with a detachable quarter jack adapter. This cable is intended for use with portable devices or those with 3.5mm jacks though it is a touch long for easy movement and on the go listening. I would have preferred a 1.2m cloth jacketed braided version of the custom litz cable for portable use. Both cables use Mini-XLR connectors for attaching to the Vali’s. 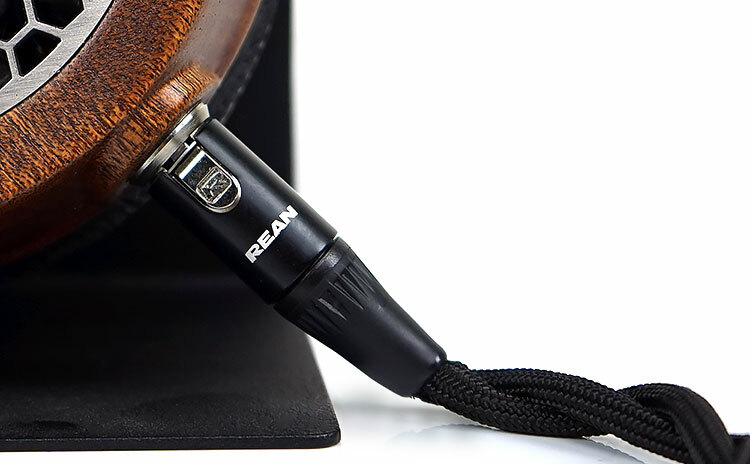 The custom litz cable uses Rean mini-XLR connectors which are a little lither than some other mini-XLR connectors I have worked with. The chrome finished cables on the stock cable are more attractive looking but have a slightly different design and no branding so I do not believe they are Rean jacks. The Vali itself does not have left or right markings on the cups but the angled design of the connectors means the cups must sit on your head with the connectors facing out. This means right and left sockets are naturally discernable from their angles. Oh wow, this is one of the sexiest retail presentations for a headphone under $1000 that I have seen in a very long time. It reminds me a little of the old Audeze wood box display from 2010-2011 but only a bit more retro in the finish. This is a real wood box and the grain is very similar in both form and color to the Vali that you would think it is actually walnut also but I would doubt that using Peruvian walnut is an affordable option for a box. Inside the box is a circular foam cutaway finish with a similar foam padding on the inside of the lid for protection. 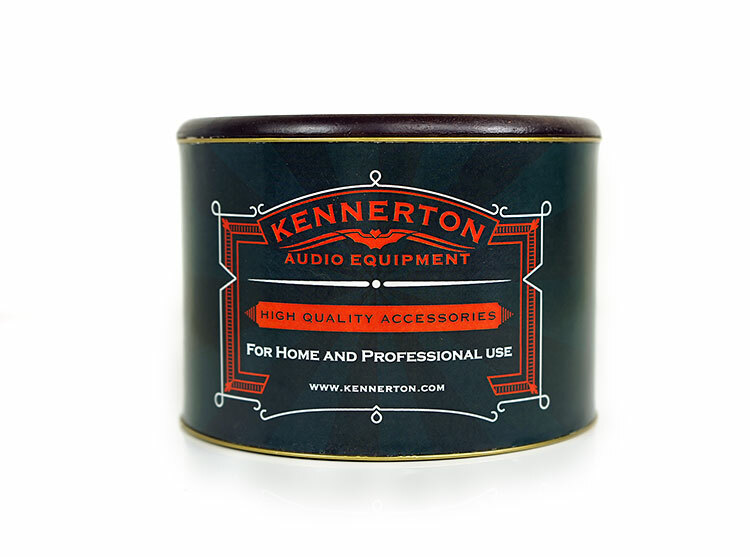 The foam is finished a chocolate colored satin cloth and branded with the Kennerton logo. It is a beautiful design and one you should not pack away after taking the headphone out. Leave it out for display and let everyone gaze at it. 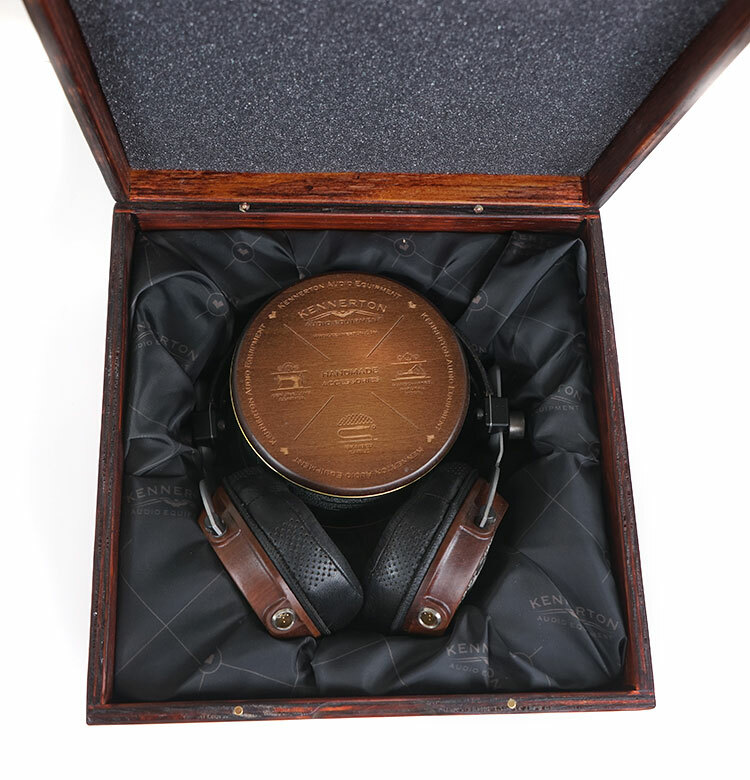 The headphones sit central and hugging that enchanting “ye olde” ingredients tin that houses the two cables and your warranty card which looks more like a credit card. You also get that spare quarter jack adapter fitted on the stock cable out of the box. I also saw chatter about a carry bag and one less cable so this could well have been the original accessory contents and it has now changed to two cables and no carry ouch. Certainly, the printed materials make no mention of two cables.